1. Spent half a day ignoring the large bag of chocolate bars that were free to a good home at work, only to succumb later in the day and shamelessly demolish an entire Crunchie bar. I could almost hear that low fat yoghurt in my bag screaming STOP!! Mmmmm but that chocolate coated honeycomb……. 2. Resolved not to do 1. again only to repeat the performance two days later. 3. Cut my finger chopping vegetables. How does that happen? I’m a surgeon for gods sakes! There was some blood. And pain. It was not good. 1. Followed my intuition and operated on a sick cat at work on Saturday. It was just as well as the poor thing had a twisted gut. Good judgement win. 2. Attempted to undo my sins (see 1.and 2. above) and launched into a 1 week detox (which is going surprisingly great, by the way!). 3. Decided to play with quinoa, a grain which I’m only just getting to know. The result was this simple and scrumptious salad that I took to work for lunch. I had previously put Quinoa in the category of ‘Things that are good for you but probably taste like cardboard’, along with corn cakes and brown rice. I am so glad I opened my mind (and mouth) to this grain. 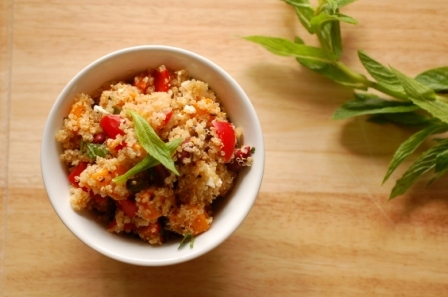 For those who haven’t tried quinoa, don’t waste another day. It has this lovely nutty quality and tends to coat all the other ingredients, sort of like a salad matrix. Plus it made me feel so angelic that I swear I could feel little wings sprouting on my back a la Black Swan (but less creepy). Boil quinoa in a pot with twice the amount of water, covered, for 13-14 mins. Then drain the quinoa and rinse in a sieve. Partly fill the pot with boiled water so that you can rest the sieve in the rim of the pot without it touching the water. Place a folded tea towel over the sieve and cover with a lid. Boil the water to steam the quinoa for 2-3 mins. Toast cumin in a non-stick pan until fragrant. Do the same to the pistachios. 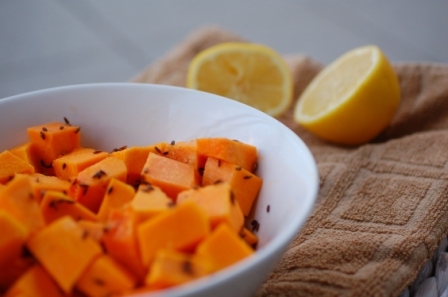 Toss Pumpkin in a bowl with cumin, a pinch of salt, a drizzle of olive oil and about a teaspoon of fresh lemon juice. Spread pumpkin out on an oven tray and bake for about 10 mins or until cooked but firm. In a bigger bowl, toss roasted pumpkin, drained quinoa, capsicum, kidney beans, pistachios, feta, juice from half a lemon, a drizzle of olive oil, chilli flakes and salt to taste (start with 1/2 tsp). Enjoy for a light, healthy lunch that cancels out previously eaten chocolate bars. This makes quite a big batch, enough for 3 or 4 lunches for me. Think of this salad as a blank canvas. You can add almost anything to it to suit your tastes and the contents of your fridge/pantry. Other additions that would go well are (but not limited to) broccoli in small florets, white beans, chopped and blanched green beans, pine nuts, chopped red onion, avocado, chick peas, tuna, pancetta and chopped up sausage. Feel free also to play around with flavourings…..amp up the chilli, add other herbs or spices, etc. etc.etc. This one I’m definitely going to try. Even though you dissed two of my favourite things – cornflakes and brown rice! ahhhh see I only dissed brown rice. The other one was corn cakes, so I’ve only half offended you 🙂 Do try it and let me know how you go! 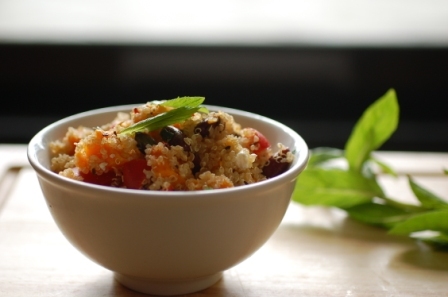 what is quinoa? Is it available in India… Great attempt Deeps…. Hi aunty, thanks a lot. Quinoa (pronounced keen-wah) is a gluten=free grain, considered one of these ‘superfoods’ as it is high in protein and low GI. It is also a good source of amino acids and calcium for vegetarians. Apparently you do get it in India, presumably in large supermarkets and health food stores, but it is on the expensive side. If only red quinoa is available, you can use that instead of white. I love quinoa too! I’ll try your steaming method next time. In your first stage of boiling, do you rapid boil it or simmer? Hi Emma! Yes, do try it. I normally bring it to a boil then reduce the heat to simmer. Thanks for demystifying this grain!